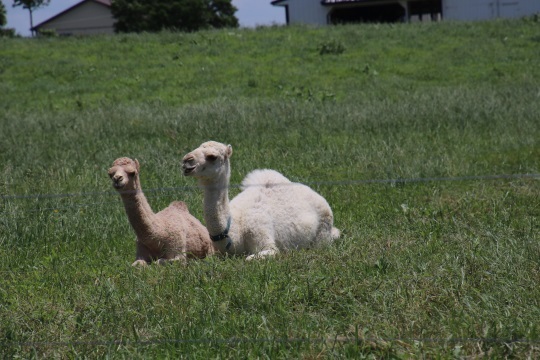 Since at least 2013, one Lancaster County Amish farm has been home to a herd of camels, roaming fields where one might otherwise expect a different sort of four-legged beast. 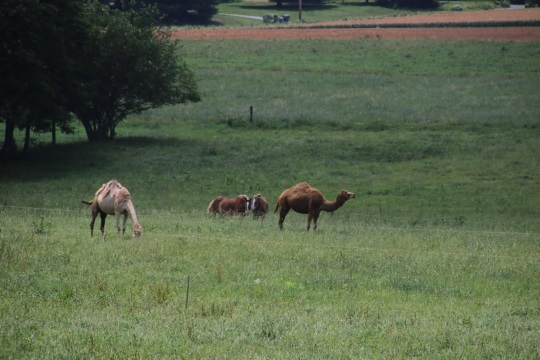 At the time, there were about a half-dozen working camel dairies in America. I’m guessing that number has only increased by now. 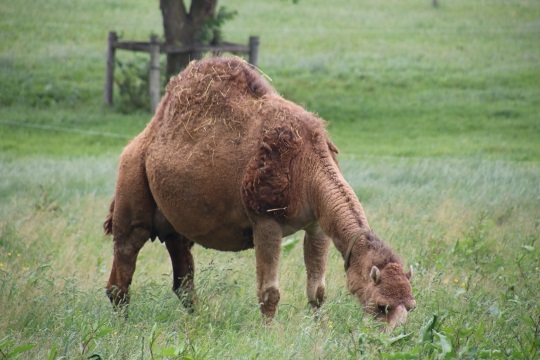 Reader Ed followed up that story with a look at the camels through his own lens in “The Camels of Lancaster County“. 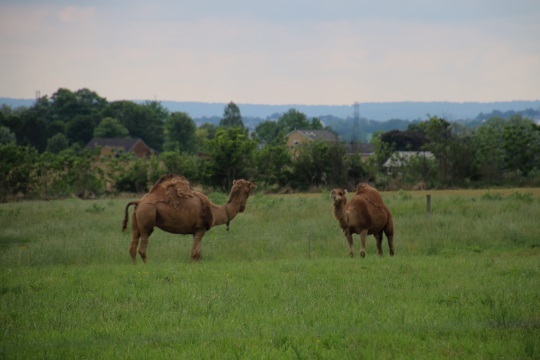 Today Ed returns with an update on the camels…and a glimpse of another unexpected beast. 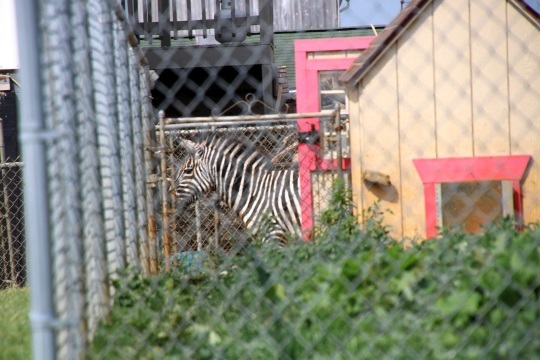 Last May, we heard from an Amish source that there was a farm on which resided a zebra, although the source claimed not to know exactly where the farm was. 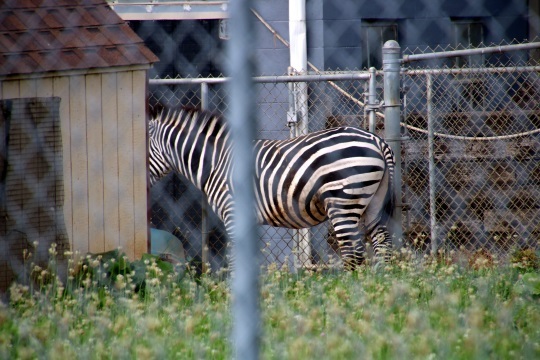 It is on an Amish farm; just what the farmer intends to do with the zebra is the subject of much conjecture. I wonder if it might not be part of a safety pilot program; certainly a zebra pulling a buggy could/would be seen day or night! Ed may have a point. I think that’s really cool. Is the milk easier to digest? 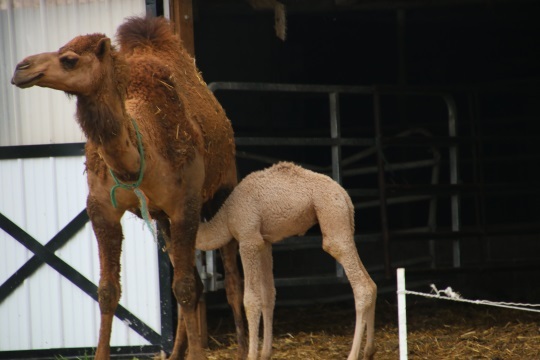 How do the camels do in the cold weather? 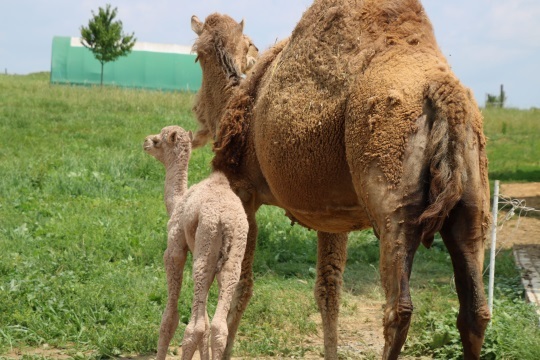 I don’t know about the milk, but there is an animal park not far from us and I’ve seen their camels with very thick winter coats, so they must be able to adapt and grow a winter coat. You are welcome. I’d be interested in knowing about the milk myself, so maybe someone else will add to that. I am surprised the Musk ox are not on more farms..
hide, rich milk, lean meat, and luxurious and exceedingly light weight and warmer fiber (which is highly prized). I didn’t know that about musk oxen. Interesting! I’ve only seen them in pictures. Maybe that will be the next “thing”? 🙂 I wonder how they would do in an Ohio summer? 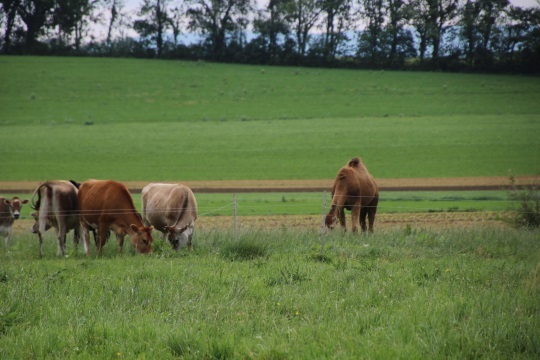 We have more pasture than our amount of stock needs… That could be interesting to try something unique! Are only found up by the Arctic Circle. The lower 48 is too warm for them. They do best in COLD winters. And yes, there fiber is very soft, it’s 8 times as warm as wool. It’s hypo allergenic…it doesn’t contain lanolin which is what many are allergic too. That is interesting, Margaret. I looked musk-ox up in an animal book at home and I got the impression they must have cooler weather, so glad to hear someone else back that up. I was fascinated to read they’ll make a ring to protect their young, with the adults’ heads facing out and the young ones inside the protective ring. Too bad they wouldn’t do well in Ohio — they seem like interesting animals. Do you know if anyone has tried to tame them? 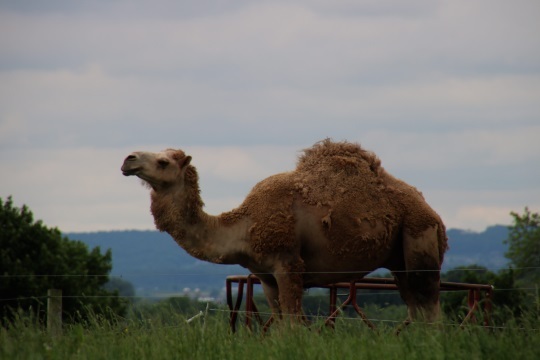 Twice a year in Lebanon County, PA is the Exotic Animal Auction. It’s a tiring 12 hour event that sells camels, zebras and almost everything else. People come from all over the world to buy, sell or just watch. I think it’s Amish owned and the about 15% of the people there are Amish. It’s very bizarre. One of this organization’s reps attended the April, 2016 auction and reports seeing animal abuse and neglect. It would be good for you to report what you saw this year. I was at the Miller’s farm on a bus tour in May. Mr. Miller told us they sell a lot of the milk to families with children with autism. If I remember correctly, l think he also said that if they don’t have enough milk to meet the demand, they get milk from Canada to supply their customers. I don’t know what purpose the milk is for and a special ed teacher I asked had never heard of it , either. Mr. Miller came on the bus and told us about his business – his children also sold us Camel Milk Soap.